Apple Store is retail store network which is owned and operated by Apple Inc. This store sells computer and electronic. On July 2011, Apple has established more than 330 stores in all over the world. Apple Store product is one of the most phenomenal electronic in the world. Not only the products that are fantastic, but the center of Apple Store in California also has unique and interesting design. Ten years ago, Steve Jobs decided to build a store especially to display and sell various kinds of Apple products. For its design, Apple has minimalist design principle. It’s true; all of Apple Stores in the world use 3 main elements, such as glass, stainless steel and wood. But, do you know the other facts about Apple Store? 1. Last May 19, Apple had its 10th birthday and Apple Store has launched a service named “Personal Setup”. What is it? In Personal Setup, the customers of Apple might get extra service from the shop assistant to do product setting as they like so that when they arrive home they can use the device straightly. 2. Steve Jobs named Apple Store as “Genius Bar”. This term was said when the boss of Apple invited the journalists to a small tour in the first Apple Store in Tyson corner Center Mall, McLean, Virginia, USA. 3. There are now 323 Apple Stores in 11 countries. It is reported that more than 1 billion of costumers come to Apple in 10 years. In the future, Apple plans to launch 40 Apple store outside USA. 4. Apple Store has spent US$ 3.19 billion, or about 13% from the total of Apple Inc income, for charity. 5. The biggest Apple Store in the world is situated in Regent Street, London, England. It has 25.000 m2 large. The store is opposite Nokia store. 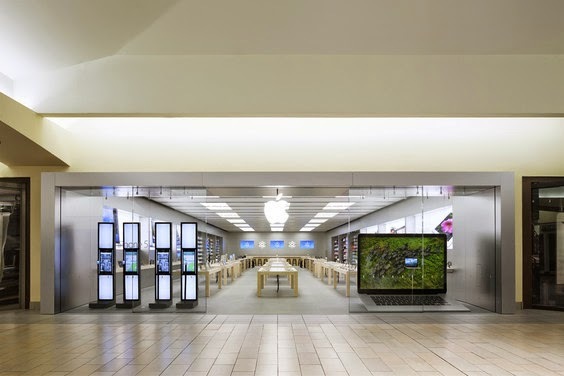 Otherwise, the smallest Apple Store is in Santa Rosa Plaza, California. It is only 540 m2. 6. Apple Store has become the only business in Apple Inc that uses consultant. All this time, Steve Jobs never use consultant for any divisions in his company. 7. Every year, when Apple releases iPhone, thousands of people are willing to queue for hours to be the first who can get the gadget. Apple is quite kind by providing drinks, snacks and umbrellas for the costumers. 8. Apple Store has more than 30 thousand employers. To become a shop assistant in Apple, we have to do a very difficult test. It is more difficult than the test to be a student in Harvard University. Each employer would be tested about his/her knowledge about Apple products. In 2009, Apple recruited 10 thousand of job application letters from the people who want to work in Apple Store Upper West Side, Manhattan. But, Apple only needed 200 employers. Meanwhile, in Harvard University, there were 29 thousand of university student candidates to get 2000 chairs. 9. To build an Apple Store, Apple spent US$ 315 thousand to buy glass, wooden furniture and stainless steel. 10. Apple Store Bondi in Australia is the only Apple store which has plants inside the store.